PacMan is back! Now it's in your Palm. Download trial version 1.7 here. PacMan for Palm is shareware. If you like it, please register the program from via Paypal for US$10. 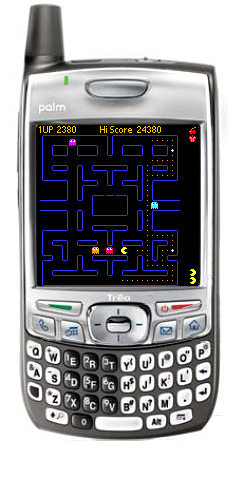 The trial version is limited to one pacman and does not keep Hi-score. For more information, please refer to the document inside the zip file. Enjoy! Final version of PacMan is ready! Thanks to beta testers who sent valuable comments and suggestions. Please download trial version here and register here. Enjoy!